Jakarta (28/6), In this Holy month of Ramadhan, sharing with others will complete and fulfill our hearts content. Therefore Multimatics held #MultimaticsBerbagi event for Yayasan Pesantren Yatim Assa’adah. 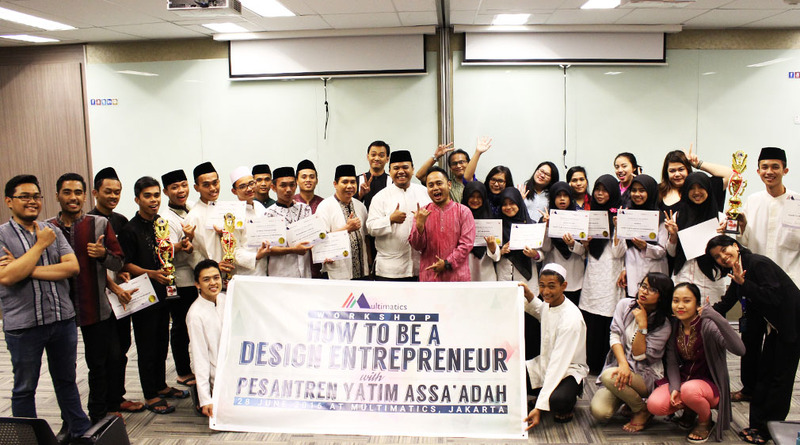 The event was one-day workshop on “How to be a Design Entrepreneur”, emphasizing on technical skill training, with 15 participants of Pesantren Yatim Assa’adah SMK senior students. Following the workshop, Multimatics family along with all participants attended short dialogue from Ustadz Fadli and then breakfasting together. To keep participants’ spirit high, we conduct a Poster Design Competition letting the creativity flow and ensuring the implementation of the training was applied. The results were remarkable. Multimatics felt grateful to be able to share with Yayasan Pesantren Yatim Assa’adah. We hope that the knowledge and skills that we shared would be useful and able to help the participants in advancing to their future endeavor.